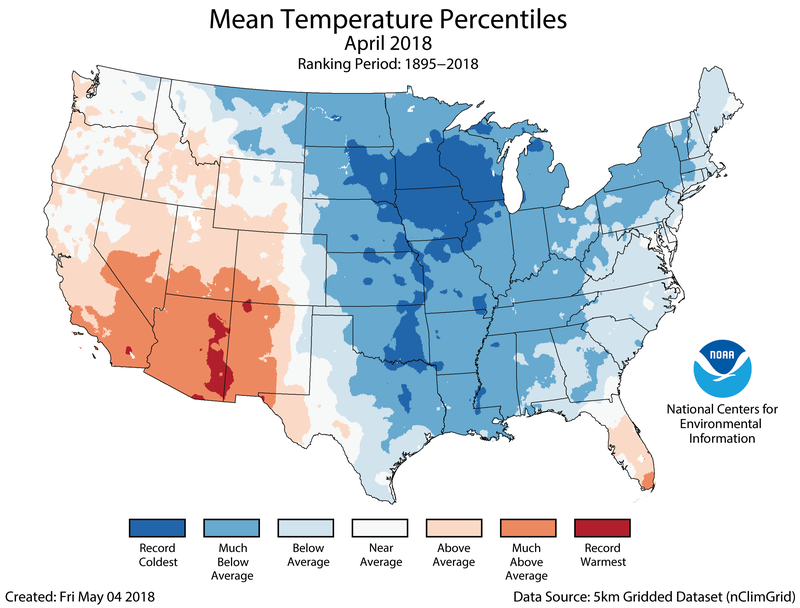 Last month, many people were wondering, “What happened to spring?” A persistent flow of Arctic air blanketed the eastern two-thirds of the nation throughout April. Record cold, and even snow in some areas, delayed the onset of warm spring-like conditions. 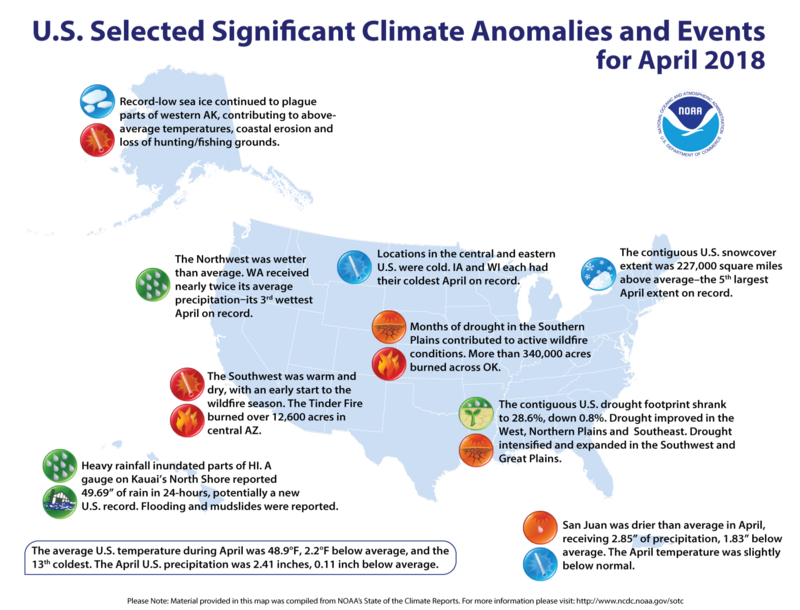 The average April temperature across the contiguous U.S. was 48.9 degrees F (2.2 degrees below average), making it the 13th coldest April of the 124-year record, according to scientists from NOAA’s National Centers for Environmental Information. This was the coldest April since 1997. The month saw record- and near-record-cold temperatures from the Northern Plains to Gulf Coast and the Northeast. The Southwest was warmer than average. The average precipitation for the month was 2.41 inches (0.11 of an inch below average), which ranked near the middle of the record. Record dryness was observed in parts of the Southwest and mid-Mississippi Valley with areas of record-wet conditions in the Northwest. 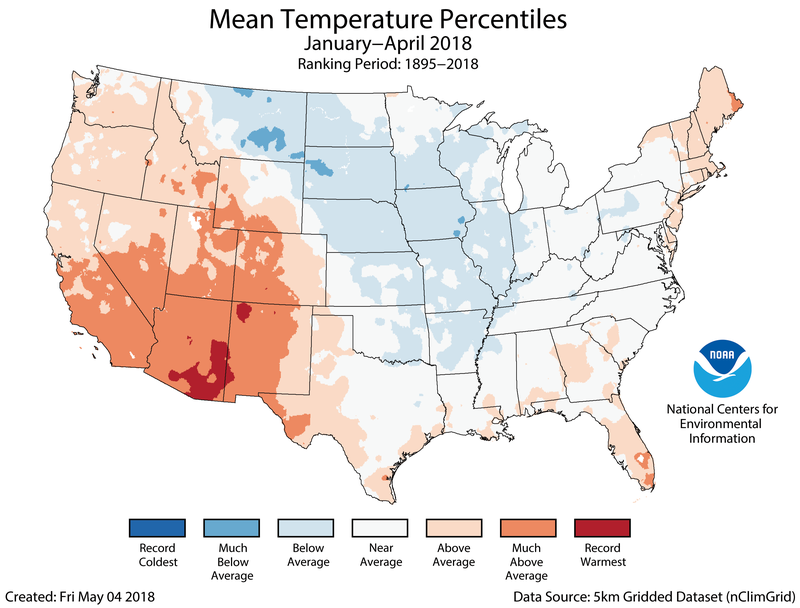 The average U.S. temperature for the year to date (January through April) was 39.8 degrees F (0.7 degrees above average), placing it near the middle of the climate record. This was the coldest start of the year for the nation since 2014. 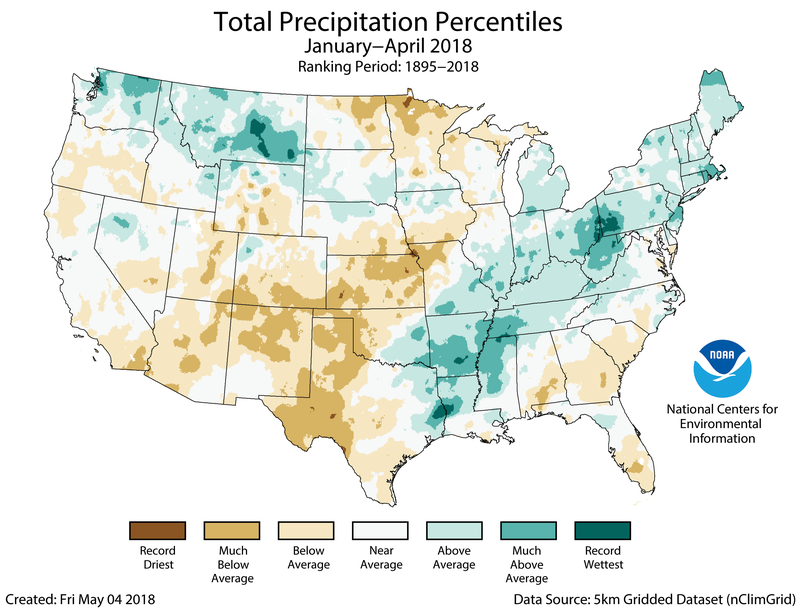 Average precipitation for the year to date totaled 9.58 inches (0.11 of an inch above normal), ranking it near the middle of the climate record. Polar outbreak chilled the nation: Twenty-two states had April temperatures ranking among the 10 coldest on record. Eight states had their second coldest April on record and two states — Iowa and Wisconsin — were record-cold and saw record snowfalls. The April snow cover across the contiguous U.S. was the fifth largest on record for April and the largest since 1997. Rain pummeled paradise: During April 14-15, heavy rainfall inundated the Hawaiian island of Kauai and caused major flooding and landslides. A rain gauge near Hanalei on Kauai’s North Shore reported 49.69 inches of rain in 24 hours, which set a potential new national record. Western warmth and dryness triggered wildfires: Warm and dry conditions in the Southwest and Southern Plains sparked an early start to wildfire season. In Arizona, the Tinder Fire burned more than 12,600 acres, and in Oklahoma, a series of grass fires burned more than 340,000 acres. 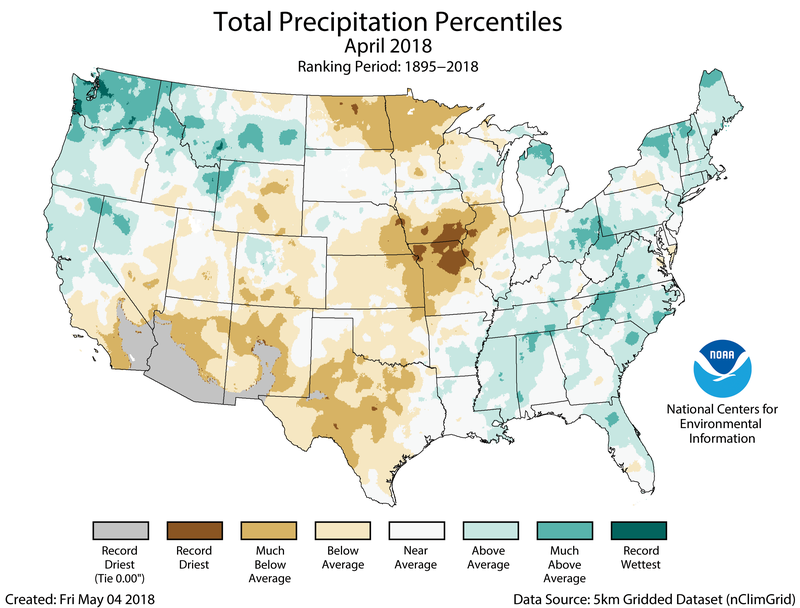 Drought worsened in parts of the U.S.: By the end of April, about 28 percent of the Lower 48 states were in drought, down slightly from 29 percent at the end of March. Drought conditions worsened across the Southwest and Great Plains, and improved in parts of the West, northern Plains and Southeast.